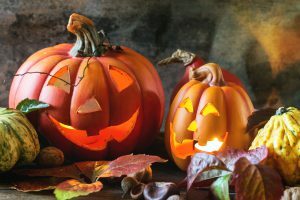 There are plenty of ways to get even more out of your jack-o-lantern pumpkin now that Halloween is over, and in this day and age of eco-friendly awareness we love the idea of recycling pumpkin material rather than just throwing it away. Here’s a great recipe for Honey Roasted Pumpkin Seeds from the Clever Carrot. 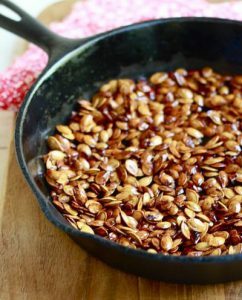 Honey Roasted Pumpkin Seeds Recipe. Add them to your composting material either whole or cut into pieces. Mix into your garden soil and they break down in a few weeks to provide nutrients for your garden. A great family project. Just carve out a section and put some bird seed in your pumpkin. 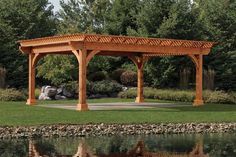 Put it out for the birds by placing it on an outdoor table or hanging it up. 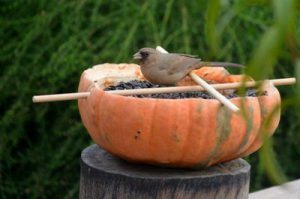 Here’s a great DIY pumpkin bird feeder from Birds and Blooms. Click here. 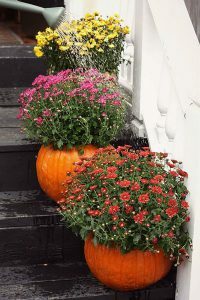 A pumpkin planter provides a colorful base to house some plants, and it should last for several weeks. 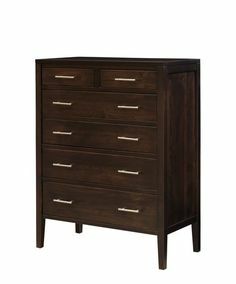 We found some beauties on CountryLiving.com Click here–it’s easy! Decorate for fall by adding your pumpkins to home or garden. You can add some dried corn, scented candles, scarecrows and other fall or winter items to turn your pumpkins toward Thanksgiving or Christmas décor. Don’t miss these adorable pumpkin transformations from Country Living. 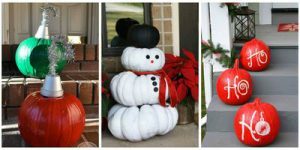 They’ve created cute snowmen, Christmas ornaments, and creative signage with some pumpkins, paint and accessories. We hope you enjoy your new creations all made from recycled Halloween pumpkins.